I got great ideas from others on the forum and figured I share back what I'm doing to transform my trailer into a toy hauling machine. Started with a new Load Rite 14F1000WT. Installed my 2" PVC bunks by remounting the trailer bunks horizontally on trailer. The original carpet covered bunk is perfect surface for amas. Ripped a 1" strips off a 2x4 and inserted inside each of the PVC pipes to strengthen and for the screws to hold the pipes. Melted the notches for the scupper vents with heat gun and used a big screw driver handle to press in the shape until it cooled. Just slide the TI on until 'clicks' into place when properly positioned. Ground off the sharp edges on two 45 degree arched PVC fittings and attached at the rear. TI slides right up on to the bunks very easily either from the water or the C-Tug. This week have been welding up the rack which will be attached with galvanized U-bolts. Rack top is 36" tall and the top is 60" wide and 7 ft long. Plans for rack are mounting a roof top cargo box for carrying all the gear needed for using the TI. Next to that will be mounting my Thule J kayak carriers so I can haul another kayak as well and will still have space for strapping on a big cooler or toys as required. I am giving up the ability to fully rig on the trailer, but needed the extra space for vacation traveling with the family and all additional stuff needed to travel with the TI. Another benefit of the rack is to get more weight on the trailer. The trailer really needed more weight on the 1000lb springs for it to ride better. This upcoming weekend plan to grind the welds, clean, prime and paint to get fully installed. Still pondering on color to paint . 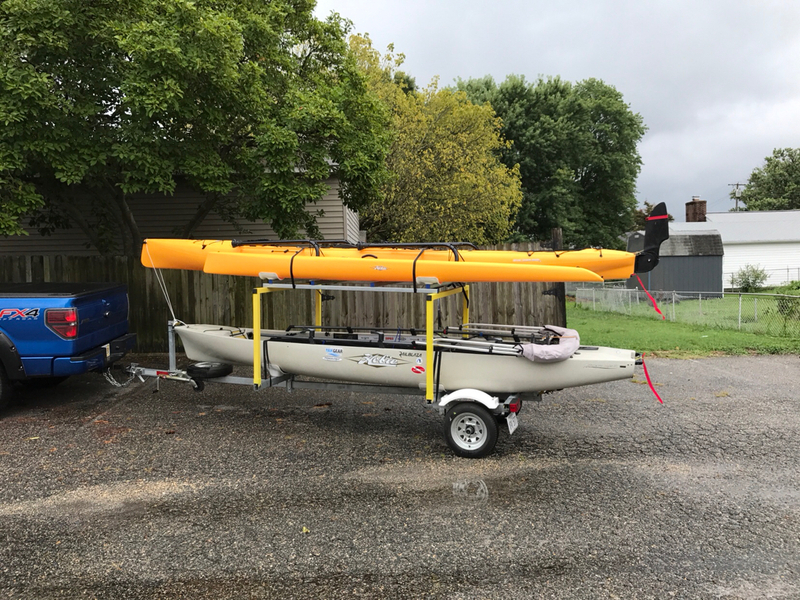 Got the papaya TI so almost thinking painting the rack to match the boat instead of the trailer. Also yellow may keep me from hitting my head on it - but probably won't. It’s aluminum so I left it alone. I painted the rack with Rust-oleum Caterpillar yellow which is pretty close to matching my papaya TI and mounted the rack on the trailer with galvanized u-bolts. 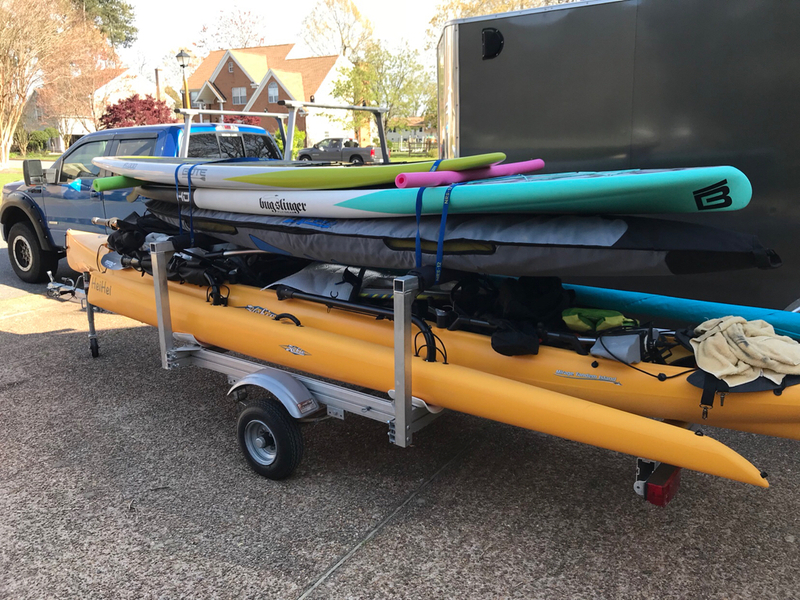 Also I built the rack with cross bars across the trailer on 67" centers so I could swap from PVC bunks and mount the Hobie cradles later if I want to. Installed a X-Cargo Sport 20 box which is huge but has plenty of space for drives, seats, vests, paddles, fishing gear, and an inflatable paddle board. Installed my kayak J-racks for hauling a second kayak. Still have plenty of space on rack to strap down any other items that may need to take along. Still need to do some road tests yet to see how much mileage dropped. I don't think I'll ever run out of space when we go on family vacations again as long as the vacation includes bring the TI. Need to pickup 3 cable locks to keep the world honest now. Picking up a third to loop thru one of trailer wheels when I leave the trailer unhooked as well. I keep a padlock on the hitch as well, but the hitch is only 2 bolts from being removed/replaced. Which cable locks are folks using to loop thru scupper holes and to their trailers? I love your winch, way better than the one I had with wimpy 1" wide strap. Makes me want to powder coat mine. I just realized you are in VA. We’ll have to do a meet up I am in the Norfolk area but go towards DC all the time. I totally cheated on the paint job. Used spray on rust-oleum primer and picked up a quart can of the caterpillar yellow at the local Tractor Supply and just brushed on. The enamel smoothed out to a great finish. Picked up a pack of the 1 1/2 end plugs from amazon to fill all the open ends on the square tubing. Overall turned out better than I expected. Have two week vacation coming up soon down in OBX North Carolina and totally psyched for sailing on the bay and possibly open water if the surf is manageable.